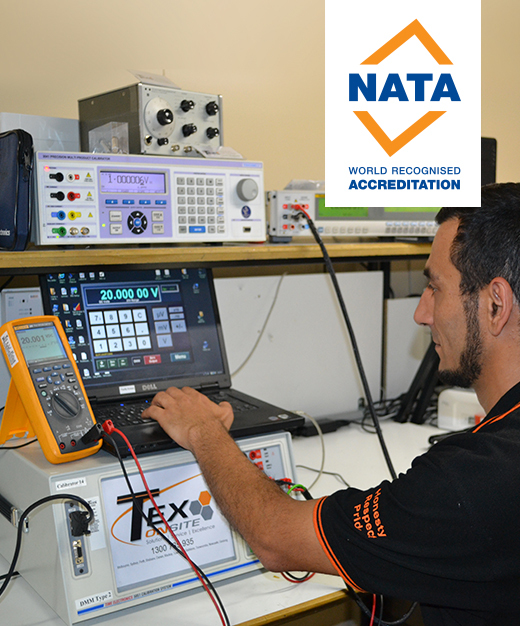 TEX Onsite operate a fully equipped National Association of Testing Authorities (NATA) Accredited Testing and Calibration Laboratory at our facility in Bayswater, Victoria. NATA endorsed testing and calibration can only be offered by a NATA accredited laboratory and will display the NATA accreditation on the completed certificate. TEX Onsite offer a wide range of NATA accredited services from our Bayswater, Victoria facility. We have a dedicated research and development team who are readily available to provide solutions in order to service each customer’s individual needs. NATA endorsed calibrations and High Voltage testing can be performed upon request. NATA is the National Association of Testing Authorities and is Australia’s national laboratory accreditation authority. NATA reviews and accredits laboratories based on their technical competence to perform specific types of testing, measurement, inspection and calibration. All NATA accredited laboratories are assessed by NATA as to their competence within a specific scope nominated by the laboratory. The importance of a laboratory’s scope is that NATA has only assessed them within their scope and as such NATA only approves the laboratory to reference NATA, or its emblem, within this scope. People requiring NATA endorsed work should be careful to determine the laboratory’s scope and ensure that it covers the work they require. A lab may offer services outside its NATA scope of accreditation however these services will not be NATA endorsed. NATA endorsed testing or calibration can only be offered by a NATA accredited laboratory and only within their scope of accreditation. A NATA endorsed test, inspection or calibration will display the NATA logo on the certificate. This is also referred to as calibration or testing traceable to national standards. This means that the equipment used to perform the testing or calibration has been calibrated by instruments more accurate than those under test and there is an auditable chain back to a national or international primary reference standard. This type of testing will not display the NATA logo, and any test, inspection or calibration not displaying the NATA logo is not approved by NATA and has no reference or traceability to NATA in any way. A common mistake is that people blur the distinction between NATA Endorsed and Standard Traceable. This has left the industry with the term NATA traceable. In true terms NATA traceable should only mean NATA Endorsed, however the term NATA traceable is used widely instead of the terminology standard traceable. If NATA endorsed is not required, then the requirement is standard traceable. The term NATA should never be identified with testing or calibrations where the NATA logo is not displayed on the test certificate and if the laboratory does not hold the appropriate NATA accreditation.